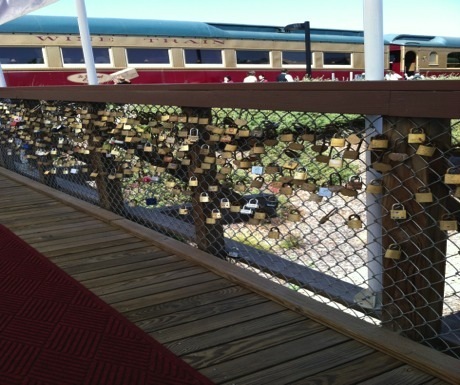 In addition to the engagement ring, you may wish to bring a padlock to this bridge that leads to the Napa Wine Train, one of Napa’s top tourist attractions. Similar to other “love lock” bridges around the world, hundreds of couples have fastened a lock onto the fencing here, symbolically joining their love together forever. This makes it a nifty place to give her your pitch, present the ring and then put a lock on the fence for you both. Afterwards you can enjoy a romantic train ride into the heart of wine country. The center of Napa Valley is the Napa River. The best place to see the river and get close to it is River Walk in downtown Napa. There, ideally perhaps on a warm evening with everything lit up, you can stroll along the riverfront with its shops, restaurants and sculptures. At the end of the promenade past Morimoto’s and the Napa Mill is a spot overlooking the river as it winds its way towards the bay. Snuggle up against the railing and follow your heart’s lead. It is hard to go wrong with Champagne when you’re making a move that will change your life—and hers—forever. A bit of the bubbly will put her in the right spirits and add some steel to your backbone. One of the best places to drink champagne (or sparkling wine) in Napa Valley is Domaine Carneros, the Carneros area winery founded by the Taittinger family of French Champagne fame. Ask for a table on the patio overlooking the vineyards. Order two glasses of, let’s say, Le Reve Blanc de Blanc. The setting, the drinks, the person you love—everything is right. The rest is up to you. Once a sleepy little farming town, Yountville has become a not-so-sleepy dining paradise with a galaxy of top tier restaurants such as Bistro Jeanty, Bottega, Bouchon, The French Laundry, Redd and more. 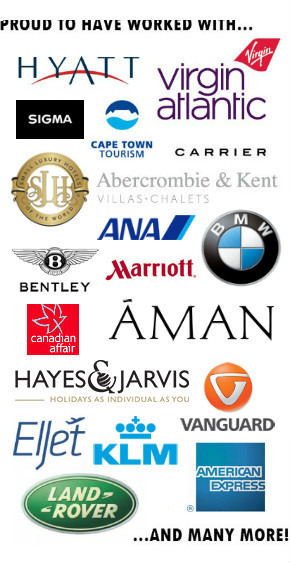 So go to one of these eateries (assuming you can get a reservation) and have a nice, romantic dinner with your beloved. But don’t ‘pop the question’ just yet; she may have an inkling that something is up because of all the trouble and expense you’ve gone to this evening. Instead, take a stroll after dinner on Washington Street to Van De Leur Park, a tiny sliver of green that’s an easy walk from most any restaurant in town. 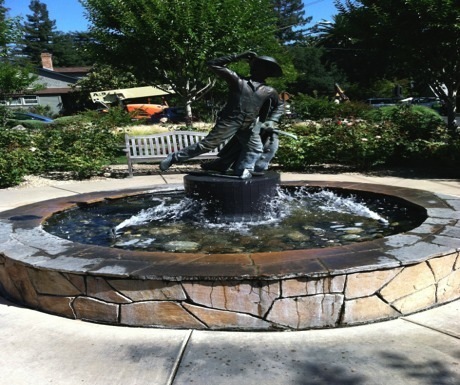 The park has sculptures and pretty flowers and in the center is a fountain that pays tribute to Yountville’s fire fighters. Now, at this spot in the quiet of the evening, surprise her. The Andaz Napa is a stylish boutique hotel that is part of the nightlife revival going on in downtown Napa. It is close to the riverfront scene (which throbs with music and people on a happening Friday or Saturday night) and is a good jumping off point for exploring the wineries up valley on Highway 29. The hipster-ish cocktail bar in its front lobby is also a swell spot to ‘pop the question’. After she says yes, you two go out and maybe hear some live music in town as a future married couple. Then again, there is another option. After she says yes, the two of you catch the elevator upstairs to your room. The hotel’s spacious marble walk-in showers easily fit two people. Imagine you’re in the middle of a tropical downpour and well, you can take it from there. Of course, if she says “No” to your proposal, the Andaz bar is still the right place to be. You’ll need a good stiff drink if that happens. Order one, and better make it a double.